Houghton Mifflin Harcourt (/ˈhoʊtən ˈmɪflɪn ˈhɑːrkɔːrt/) is an educational and trade publisher in the United States. Headquartered in Boston's Back Bay, it publishes textbooks, instructional technology materials, assessments, reference works, and fiction and non-fiction for both young readers and adults. 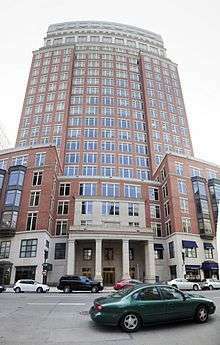 The company was formerly known as Houghton Mifflin Company but changed its name following the 2007 acquisition of Harcourt Publishing. Prior to March 2010, it was a subsidiary of Education Media and Publishing Group Limited, an Irish-owned holding company registered in the Cayman Islands and formerly known as Riverdeep. In 1832, William Ticknor and James Thomas Fields had gathered an impressive list of writers, including Ralph Waldo Emerson, Nathaniel Hawthorne, and Henry David Thoreau. The duo formed a close relationship with Riverside Press, a Boston printing company owned by Henry Oscar Houghton. Shortly after, Houghton also founded a publishing company with partner George Mifflin. In 1880, Ticknor and Fields and Houghton and Mifflin merged their operations, combining the literary works of writers with the expertise of a publisher and creating a new partnership named Houghton, Mifflin and Company. The company still had debt from when it merged from Houghton, Osgood and Company, so it decided to add partners. In 1884, James D. Hurd, the son of Melancthon Hurd became a partner. Three people in 1888 became partners as well: James Murray Kay, Thurlow Weed Barnes, and Henry Oscar Houghton, Jr. Shortly thereafter the company established an Educational Department, and from 1891 to 1908 sales of educational materials increased by 500 percent. Soon after 1916, Houghton Mifflin became involved in publishing standardized tests and testing materials, working closely with such test developers as E.F. Lindquist. The company was the fourth-largest educational publisher in the United States in 1921. In 1961, Houghton Mifflin famously passed on Julia Child's Mastering the Art of French Cooking, giving it up to Alfred A. Knopf who later published it in 1962. It went on to become an overnight success and is considered by many to be the bible of French cooking. Houghton Mifflin's strategic error was depicted in the 2009 film Julie & Julia. In 1967, Houghton Mifflin became a publicly traded company on the New York Stock Exchange under the stock symbol HTN. Under (new from 1991) president Nader F. Darehshori Houghton Mifflin acquired in 1994 for $138 million McDougal Littell, an educational publisher of secondary school materials, and in following year D.C. Heath and Company, a publisher of supplemental educational resources. In 1996, the company created their Great Source Education Group to combine the supplemental material product lines of their School Division and these two companies. Mergers and acquisitions (M&A) activities have had major effects on this company. In 2001, Houghton Mifflin was acquired by French media giant Vivendi Universal for $2.2 billion including assumed debt. In 2002, facing mounting financial and legal pressures, Vivendi sold Houghton to private equity investors Thomas H. Lee Partners, Bain Capital, and Blackstone Group for $1.66 billion, including assumed debt (approximately 25% less than Vivendi had paid a year earlier). On December 22, 2006, it was announced that Riverdeep PLC had completed its acquisition of Houghton Mifflin. The new joint enterprise would be called the Houghton Mifflin Riverdeep Group. Riverdeep paid $1.75 billion in cash and assumed $1.61 billion in debt from the private investment firms Thomas H. Lee Partners, Bain Capital and Blackstone Group. Tony Lucki, a former non-executive director of Riverdeep, remained in his position as the company's chief executive officer until April 2009. Houghton Mifflin sold its professional testing unit, Promissor, to Pearson plc in 2006. The company combined its remaining assessment products within Riverside Publishing, including San Francisco-based Edusoft. On December 3, 2007, Cengage Learning (formerly Thomson Learning) announced that it had agreed to acquire the assets of the Houghton Mifflin College Division for $750 million, pending regulatory approval. On November 25, 2008, Houghton Mifflin Harcourt announced a temporary freeze on acquisition of new trade division titles, allegedly in response to the economic crisis of 2008. The publisher of the trade division resigned, apparently in protest. Many observers familiar with the publishing industry saw the move as a devastating blunder. On July 27, 2009, the Irish Independent newspaper reported that Houghton Mifflin Harcourt's controlling shareholder EMPG was in the process of a re-structuring negotiations with its unsecured-debt holders that would lead to the conversion of the debt into equity. The news story reported that the unsecured debt holders would receive a 45% equity stake. As a result, the royal family of Dubai via their Istithmar World Capital investment vehicle became major stakeholders. Estimates were that EMPG would cut its debt from $7.3bn to $6.1bn. On August 15, 2009, the Financial Times newspaper reported in an interview with Houghton Mifflin Harcourt's CEO at the time, Barry O'Callaghan, that the refinancing had received approval of more than 90% of lenders. The terms included the holding company debt converting into 45% of the fully diluted common equity, an effective 25 per cent relaxation of financial covenants, second lien lenders agreeing to convert their holdings into a PIK instrument, reducing annual interest costs by $100m, and a further $50m increase its working capital facility. A further restructuring of Houghton Mifflin Harcourt's debts was confirmed by the company on January 13, 2010. The proposed restructuring materially impacted the shareholders of EMPG, the former holding company of Houghton Mifflin Harcourt. On February 22, 2010, Houghton Mifflin Harcourt announced that EMPG and HMH had reached an agreement to restructure the finances of the company and recapitalize its balance sheet with a substantial fresh cash investment by institutional investors. The agreement, supported by 100% of HMH's creditors, highlighted a reduction in the senior debt to $3 billion from the current $5 billion, with new equity issued to the senior debt holders (including Paulson & Co. and Guggenheim Partners), conversion of the $2 billion mezzanine debt into equity and warrant, receipt of $650m of new cash from the sale of new equity. In addition to the key highlights, HMH announced its new $100m Innovation Fund, to invest in the next generation of technology for the education industry. The Irish Times reported that the investments by the then equity holders of EMPG, including HMH's CEO at the time, Barry O'Callaghan, private clients of Davy Stockbrokers, Reed Elsevier, and others of over $3.5 billion would be written down to zero. Additionally, the Irish Independent reported that following the restructuring, the investors of EMPG would have a nominal investment in Houghton Mifflin Harcourt via warrants over 5% of the company if it exceeded the $10 billion valuation placed on the company at the time of the merger between Houghton Mifflin Riverdeep and Harcourt. In addition to the warrants in HMH, the EMPG shareholders would continue to own a stake in the international investment vehicle, EMPGI which has stakes in China, the Middle East and elsewhere. The Financial Times reported that no management changes were expected as part of the deal with both the CEO at the time, Barry O'Callaghan and the CFO, Michael Muldowney expected to remain in their roles. The Times reported that a new nine-member board was to be created with the CEO the only executive representative, one independent, two representative of Paulson & Co, and one director from each of Apollo, BlackRock, Guggenheim Partners, Fidelity and Avenue Capital. On March 10, 2010, Houghton Mifflin Harcourt announced that it had completed its re-capitalization. In addition to a new investment of $650 million of equity, the debt levels of the company were reduced by approximately 60% and the annual interest payments by over 75%. According to the Irish State Broadcaster, RTÉ, the old equity investors based in Ireland has lost all their investment. The Irish Independent reported that the old shareholders were denied a shareholders meeting to vote or discuss the restructuring. The former shareholders have been left with warrants over 5% of the company, in the case its value recovers to previous levels. On September 19, 2011, it was announced that Linda K. Zecher would be replacing Barry O'Callahan as chief executive officer and Director of Houghton Mifflin Harcourt after O'Callahan resigned. Zecher went to HMH from Microsoft. She currently works in the corporate headquarters in Boston. In 2012, HMH acquired the culinary and reference portfolio of John Wiley & Sons, including CliffNotes and Webster's New World Dictionary. The company went public in November 2013. On September 22, 2016, Zecher resigned from HMH and was replaced by Interim CEO and Board Member L. Gordon Crovitz. Crovitz is a former publisher of the Wall Street Journal. Curious George at the Zoo was rated a Top Ten app under the Education Games category for the iPad, iPhone and iPod Touch in 2012. Go George Go!, a mobile app for preschoolers, received the Editor's Choice Award from the Children's Technology Review in 2011. Go Math!, a K–6 product, was named a Reader's Choice Top 100 product by District Administration in 2010. The company was ranked the 10th worst place to work in America, according to a survey by Glassdoor in 2009. ↑ "Pronunciation Guide" at the Wayback Machine (archived December 23, 2007). Houghton Mifflin. Archived from the original on December 13, 2007. ↑ "Houghton Mifflin Harcourt Publishing Company: Private Company Information – Businessweek". investing.businessweek.com. Retrieved April 23, 2012. ↑ "History of Houghton Mifflin Company – FundingUniverse". Fundinguniverse.com. Retrieved 2013-08-18. ↑ "About McDougal Littell". Mcdougallittell.com. Retrieved 2013-08-18. ↑ "COMPANY NEWS; VIVENDI FINISHES SALE OF HOUGHTON MIFFLIN TO INVESTORS." New York Times, January 1, 2003. ↑ "Irish company completes Houghton Mifflin acquisition", Bookdownloading.com, December 22, 2006. ↑ Edgecliffe-Johnson, Andrew and Peter Smith. "Riverdeep in talks over $3.5bn takeover of Houghton Mifflin", Financial Times, October 25, 2006. ↑ Trachtenberg, Jeffrey A. "Writers' Block: Houghton Won't Acquire New Books", Wall Street Journal, November 25, 2008. ↑ Archived December 6, 2008, at the Wayback Machine. ↑ Streitfeld, David (December 28, 2008). "Bargain Hunting for Books, and Feeling Sheepish About It". The New York Times. ↑ "A New Day in Catechesis – Our Sunday Visitor Acquires Harcourt Religion Publishers from Houghton Mifflin Harcourt". Prweb.com. June 5, 2009. Retrieved 2013-08-18. ↑ "Dubai's royal family to buy up stake in EMPG". Independent.ie. July 28, 2009. Retrieved 2013-08-18. ↑ Edgecliffe, Andrew (August 15, 2009). "EMPG refinancing will cut $7.6bn debt". FT.com. Retrieved 2013-08-18. ↑ "EMPG pushes for financial shake-up". FT.com. January 14, 2010. Retrieved 2013-08-18. ↑ "Houghton Mifflin Harcourt Secures New $650-Million Cash Investment and Recapitalizes Balance Sheet in Historic Restructuring". Bookdownloading.com. Retrieved 2015-05-31. ↑ "Houghton Mifflin Parent Company Restructures Debt - WSJ.com". Online.wsj.com. February 23, 2010. Retrieved 2013-08-18. ↑ "EMPG agrees $650 cash injection". The Irish Times. Retrieved 24 February 2015. ↑ "EMPG restructuring an end for old order". Independent.ie. February 23, 2010. Retrieved 2013-08-18. ↑ Edgecliffe, Andrew (February 23, 2010). "Debt deal averts HMH bankruptcy". FT.com. Retrieved 2013-08-18. ↑ "Houghton Mifflin Harcourt Announces Successful Completion of Balance Sheet Recapitalization". Business Wire. March 10, 2010. Retrieved 2013-08-18. ↑ "O'Calaghan firm completes debt deal – RTÉ News". Rte.ie. March 10, 2010. Retrieved 2013-08-18. ↑ "Shareholder anger over EMPG deal". Independent.ie. March 11, 2010. Retrieved 2013-08-18. ↑ "In Deal With Wiley, Houghton Acquires Cookbooks and CliffsNotes". Media Decoder Blog. Retrieved 2014-09-06. ↑ "Curious George – Educational Games, Activities & Videos for Kids". Hmhco.com. Retrieved 2013-12-11. ↑ "Go George Go! | Children's Technology Review". Childrenstech.com. January 11, 2011. Retrieved 2013-08-18. ↑ "Reader's Choice Top 100". DistrictAdministration.com. Retrieved 2013-11-13. ↑ Wulfhorst, Ellen (December 16, 2009). "List of top U.S. places to work: survey". Reuters. Retrieved 2013-08-18. Wikimedia Commons has media related to Houghton Mifflin Company.